We had only been in Delray for a couple of days and already some of my friends that were visiting the area on this holiday week were ready to try something else. The sport in mind was paddleboarding. Beth said that it is actually relaxing and that anyone can do it. It is a great exercise. Up and down on a calm beach, like Delray, would be just the type of thing to do. We had already gotten all the information needed in order to decide if this was something to try so the following day we headed to the beach. I think they are ready!! The name of the company is Delray Beach Water Sports, Inc. and they are located on 400 S. Ocean Blvd., Delray Beach, FL 33483. Tel. 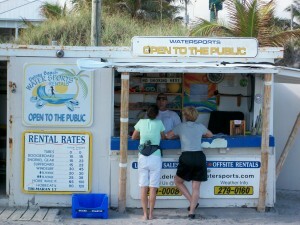 is 561-279-0008 and the website is www.delraybeachwatersports.com. 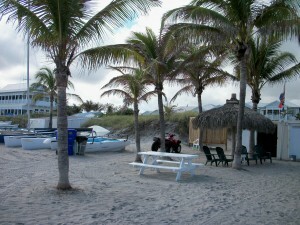 E-mail address is info@delraybeachwatersports.com. It is very easy to find. Just go 1/2 mile south of Atlantic Ave., and it will be right there on Casuarina Rd. and A1A (traffic light), but right on the beach. 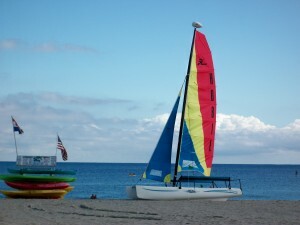 You can rent all kinds of equipment, like surfboards, windsurfing boards, paddleboards, kayaks, and sailboats. A free orientation is included with your rental. Groups and party rates are also available. Albert was the person in charge on Thanksgiving Day and we needed 5 paddleboards. Some were easier and wider than others. Beth was ready to go because she had done it before. Shelley wanted to wear a lifejacket but for this particular sport you do not need one because you are right there by the shore. Albert gave them the instructions. Notice that I said gave them and not me the instructions and that is because I decided to be a spectator. It looked like the concept was the same as canoeing. Albert gave them all a push and they did pretty well considering they had not done it before. I think the women had better balance than the guys. We were not having our Thanksgiving Dinner until the evening, so this was a good way to spend a couple of hours on a beautiful sandy beach in Delray Beach. We really would like to thank Albert for taking care of us. And please check their website because it has a lot of information. Please note that Delray Beach Water Sports has a partner called Richwagen’s which is for the rental or sale of bike and sports equipment. Their new address is 298 NE 6th Ave., 3 blocks north of Atlantic Ave., on the North bound Federal Highway at NE 3rd St.
Delray Beach Christmas Parade info. if you are riding: The date is Saturday, December 8th at 6 p.m. Please arrive early to cross the bridge to the east line-up spot if you are riding in the parade. The theme is Holidays @ the Beach. No Santas, and no throwing candy is allowed, per city rules. A party will follow at the Bike Shop with food, fun, beer and pops for the kids. Call Albert or Lisa for more info. at 561-276-4234. 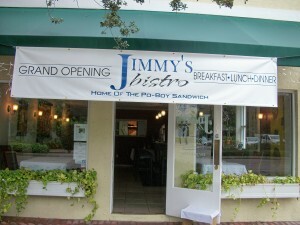 In Delray Beach, Florida….Jimmy’s Bistro….is the home of the Po-boy Sandwich….Foodies, please take notice…. Once again word of mouth proves to be a very powerful advertising tool. I got an e-mail from Ellen, who had found my website and wanted me to know that she had found this new restaurant that had just opened in Delray Beach. She liked it a lot and thought I should try it. The next day I went for lunch to Jimmy’s Bistro. The address is 9 South Swinton, Delray Beach, FL 33483. It is very easy to find; all you have to do is go south after reaching the corner of Atlantic Ave. and Swinton. It will be 1/2 block on the left. The tel. is 561-865-5774 and his e-mail address is Jimmyspoorboybistro@gmail.com. They deliver ($15 minimum order) and are open for breakfast, lunch and dinner Mondays through Saturdays. Breakfast only on Sundays. A kid’s menu is available upon request. This eatery will likely become a frequently visited neighborhood type restaurant. Jimmy’s friendly disposition will win you over. Jimmy’s is small, with about 6 tables or so and a bar that probably seats about 8 people. Lots of colorful art adorn the walls and I could tell some were from West Virginia. Immediately we started a conversation and he told me that he was from West Virginia and then lived in New York for many years. Now we are the lucky ones to have him in Delray. Jimmy did not know that I wanted to review the restaurant and I explained to him that Ellen had suggested I try it. I forget now exactly how he put it but it was something like “you should spread the word out”. Little did he know that I was probably going to do so. 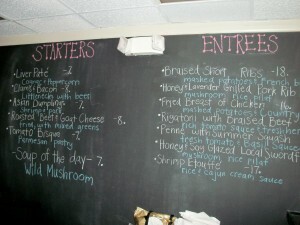 There is a set menu for lunch, but for dinner you will find his evening’s offerings written on a chalkboard. It changes every day. Both of my children started with the Israeli Salad. It was the size of a dinner salad and they really liked it. It had mixed greens, tomato, cucumber, olives and feta cheese in balsamic vinaigrette. I had the Fried Shrimp Po-Boy, which was Jimmy’s suggestion and was also what Ellen had tried. This sandwich had lightly breaded jumbo shrimp with lettuce, tomato and home-made lemon aioli. The seasonings were so good inside that warm and slightly grilled French bread. I could not have asked for anything better on a rainy day in Delray. My children tried the Grilled Chicken Po-Boy, which had grilled breast of chicken with grilled red onion and a home-made chipotle mayo and the Grilled Steak Po-Boy, which had hanger steak with grilled red onion and the same chipotle mayo as the other. They both said that they had not had a sandwich that good in a long time. So, the question is: Do you know what a Po-Boy is? Po’Boy, Po-Boy, Po Boy, or Poor Boy mean the same; a traditional submarine sandwich from Louisiana. It usually consists of meat or seafood, most of the time fried and served on a baguette-like (French bread, very crisp crust) Louisiana bread. Other salads available: Grilled Chicken Cobb, Grilled Chicken Caesar, Tomato & Mozzarella, and Grilled Hanger Steak and Avocado. Besides the Po-Boys we had, a Fried Fish Po-Boy is available which has lightly breaded filet of flounder with lettuce, tomato and home-made lemon aioli. If you do not wish to have the French bread then all sandwiches can be made as wraps, but you will be missing something there. Sandwiches are served with black bean salad; tasty. Jimmy thought that the beans were a little hard that day but I thought that for a salad you don’t want them mushy. Now, if they are to be served on top of rice then I would have certainly cooked them a little bit more. They really were good. For that evening’s dinner, he already had the chalkboard full of items. For starters: Liver Pate, Clams and Bacon (little necks with beer), Roasted Beet and Goat Cheese, fried with mixed greens, Tomato Bisque with a parmesan pastry. The soup of the day was wild mushroom. For dinner: Braised short Ribs, Honey and Lavender Grilled Pork Rib Eye, Fried Breast of Chicken with mashed potatoes and country gravy, Rigatoni with Braised Beef, Penne with Summer Squash, Honey & Soy Glazed Local Swordfish and Shrimp Etouffe. Jimmy’s Bistro now has a liquor license. They offer wine and beer. I told him he should get some of that very popular Dog Fish Head that comes from Delaware. Available drinks: Soft drinks, bottled water, Pellegrino and Inkos Iced Tea, which is a 100% white tea and comes from New York. I had it and it was refreshing; very good. Jimmy’s Bistro is very affordable, so please keep that in mind, as well. Word of mouth; this is what this post is… I have tried it, liked it, and will be back again. Now it’s your turn…..
At the Delaware Beaches….Ocean City, Maryland….Delray Beach, Florida….Happy Thanksgiving to All…. I love the smell of the turkey cooking in the home on Thanksgiving Day. I also like to have a gray and cooler day. I have tried different ways of cooking turkeys and bought the organic ones, the free range ones, the different brand ones but one of my favorites has been the turducken. I have also have bought the turducken from a few companies but my best one has been from a company called the Cajun Grocer, from LaFayette, LA. Their website is www.cajungrocer.com. Besides being delicious, it is also a conversation piece. A turducken is a semiboneless turkey stuffed with a deboned chicken, stuffed with a deboned duckbreast. In between each bird a Cajun dressing is placed to create 6 layers of stuffing. Different varieties of dressings are available. As you sliced the turkey, you will get a taste of all the different birds. Its funny when you start thinking what to do with the turkey leftovers. Sometimes I really don’t have that much leftover; maybe for one more meal. But, if you do have leftovers, here are a few recipes that you might enjoy. Cut peppers. In a bowl, combine curry powder, cornstarch, ginger and salt; mix well. Add turkey and toss to coat evenly. Heat a 12 inch skillet over medium heat until hot. Lightly spray pan with nonstick cooking spray. Add turkey and garlic. Cook and stir about 5 minutes. Remove f rom skillet. Add peppers and cook for a couple of minutes. Stir in coconut milk, pineapple and turkey and bring to a boil. Reduce heat and simmer over low heat about 10 to 15 minutes or until sauce thickens. Add cilantro and mix gently. Serve over the rice. Sprinkle with the peanuts or toasted coconut or both. Note: To toast the coconut, just spread it on a cookie sheet and put it in a 350 degree oven and keep watching it because it will toast before you know it. If you do not have enough turkey, you can substitute chicken. If the turkey or chicken is raw then add more minutes to the cooking on the skillet. 1/2 red pepper, finely diced. In a medium size skillet heat oil over medium heat. Add red pepper, scallions, garlic, Italian seasoning and pepper. Cook for about 4 minutes or so. Add turkey and cook until well heated. Stir tomato sauce, barbecue sauce and sugar. Simmer about 3 or 4 minutes until slightly thickened. Remove from heat and spoon into hamburger buns or rolls. Note: If you don’t want to have the rolls then serve it with tortilla chips as a dipping/salsa sauce. Serves 4 with rolls and a few more if used as a dipping sauce. Note: The above recipes can easily be adjusted to be gluten free. Have a Great Day!! Happy Thanksgiving or Feliz Dia de Accion de Gracias!! Comments Off on At the Delaware Beaches….Ocean City, Maryland….Delray Beach, Florida….Happy Thanksgiving to All…. Nowadays, it does not matter in what city you find yourself, you will find the influences of Latin food. Could it be that the seasonings, spices and heat awake your senses like no other food? Nuevo Latino (New Latin) is a new term used by many restaurants. But, what is it? It is a conglomerate of flavors that mix traditional, Mexican, Puerto Rican, Cuban and contemporary American food. Growing up in P.R. you could tell if one dish was from Cuba, Puerto Rico, other Caribbean Island or Latin America but now even though you can still tell that pasteles are from Puerto Rico, ayacas are from the Dominican Republic and tamales from Mexico, some of the other spices and ways of cooking have integrated and made this new wave of Nuevo Latino cooking. When did you ever hear of taking a piece of fish and topping it with a mango, cilantro, blood orange and chopped jalapeno salsa? And, that is what takes me to Cabana El Rey on Atlantic Avenue in Delray Beach. Cabana has been in this Village by the Sea for several years. 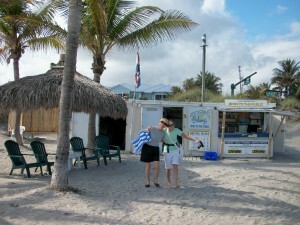 The address is 105 East Atlantic Ave., Delray Beach, FL 33483. The tel. 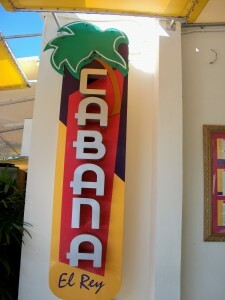 is 561-276-9090 and the website is www.cabanarestaurant.com. Besides the restaurant in Delray, they have Cabana Las Palmas in West Palm, Cabana Midtown in NYC, Cabana Seaport, NYC and the Original Cabana in Forest Hills, NYC. I am concentrating on the one in Delray. 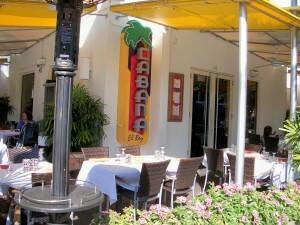 Like a lot of the restaurants in Delray, you have the availability to seat outdoors; on the sidewalk, and Cabana has the perfect corner. They have updated their outdoor seating with yellow awnings and extended the seating area, as well; with plants, which make it private but at the same time you will not be missing what’s around you on the Avenue. Beautiful view of the Christmas tree this time of the year. 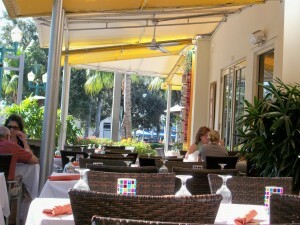 The inside of the restaurant is very nicely decorated with bright colors reminding you that you are in South Florida. It has somewhat of an open kitchen in the back so you can see the comings and goings of that most important part of a restaurant. The bar has plenty of seating and a focal point in the restaurant; the blue lights add to the atmosphere of Cabana. If you like Mojitos, which are now served in every restaurant, I would say that the ones at Cabana’s are the best. Traditionally made and no other flavors added it is served with a sugar cane stick. 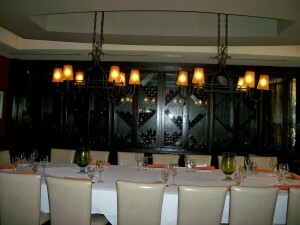 The Wine Room is a private room at Cabana that lets you have your own party, and your own private wait staff. I have used this room for a party and it will seat, I believe up to 16 people. It is a room rich in woods and wine bottles and looks like a private dining room in a home. You need at least 10 people to reserve this room and a minimum spent. Great individual service. My choice of seating is outdoors, when possible. Besides enjoying their food, I also enjoy their choice of music; the Buena Vista Social Club and Gloria Estefan, among others. 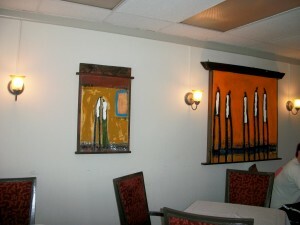 Their menu is varied and very affordable, both for lunch and dinner. They have appetizers and tapas, salads, side dishes, Platos Nuevo Latino, traditionals, lunch specials, sandwiches and desserts. A take-out menu is available, as well. My favorite appetizers/tapas are the mariquitas which are thinly sliced plantains cooked until crisp, served with garlic mojo dipping sauce. Mariquitas are the Puerto Rican platanutres. I also like the ceviche mixto which is shrimp, octopus, scallops and calamari, marinated in aji amarillo, hot rocoto peppers, garlic, lime juice and cilantro, served with different types of root veggies and toasted corn. I like the tostones, which are the green plantains that are fried, mashed and fried again and served with your choice of chicken sofrito, ropa vieja or picadillo. I make my own tostones and if I may say so myself, I think mine are better but if I am taking someone to Cabana for the first time, I would certainly order them. Their La Playa salad is great because it has grilled shrimp, sea scallops, avocados, plum tomatoes, onions and tossed with a ginger citrus mojo over field greens. Typical Latin side dishes are the arepas con queso which are the corn meal cakes with white cheese, maduros which are the fried sweet ripe plantains, saffron flavored rice, rice flavored with coconut milk, beans flavored with chorizo, yuca fries served with garlic mojo, among others. Mero Chileno which is the pan seared filet of Chilean sea bass, saffron beurre blanc salsa, leaf spinach saute and yuca manchego cheese. Another good example is the Coco Cabana Pollo which has broccoli, spinach, carrots, snap peas and Caribbean root veggies like yucca, calabaza (pumpkin) and yautia, sauteed with curry, coconut milk and habanero peppers. How about that mix of flavors? Some of their traditionals are the paellas, either the seafood or the Spanish, the picadillo, the arroz con pollo (rice with chicken) in sofrito with chorizo (Spanish sausage) and Spanish olives in a caldera of saffron rice. I really love their Pollo Asado, which is a half roasted chicken rubbed with adobo (garlic, oregano, lime and extra virgin olive oil). It is perfectly cooked and seasoned. They have it available for lunch and dinner. Sometimes they have a rice with squid in its own ink. This rice will be almost black with squid and it is fantastic. It is not on the menu but they do offer it once in a while. It reminds me of the one my grandmother, Mamota, used to make in Humacao. They have plenty of desserts and sometimes I order the flan but I usually try to avoid desserts and instead order coffee. It is a fun restaurant and usually a must stop for me. So if you are in the Delray Beach area and have had enough turkey, then this might be the place to visit and if you do, let me know how you like it. Please make sure to check my post for Events under Categories then scroll down to the November 16th’s post because some of those events are about to happen soon. Saturday, November 28th – Pinelands Trail (2 miles). Join the Park’s naturalist on a guided hike to be one step closer to completing the trail challenge and entering the drawing to win prizes. Take a walk along the Pinelands Trail and experience the beauty of the maritime forest along the base of the Great Dune. Meet at the Seaside Nature Center at 11:00 a.m. For more info., please call 302-645-6852. Saturday, November 28th – Fire Power Tour – 2:00 – 3:30 p.m. Pre-registration is required. Learn how the artillery pieces that protected our coast during WWII worked, participate in a gun drill, see a firing demonstration, and discover why Cape Helopen was so heavily fortified. Limited to 20. $5 per adult and $2.50 per child. Call the Seaside Nature Center at 302-645-6852 for more info. and to pre-registrate. Directions: Follow the “Fort Miles” signs to the Historic Area parking lot. Walk the paved road through the Cantonment area to the orientation building; the last building on your right. Thursday, December 3rd – Lunch and Learn – Noon to 1:00 p.m. at the Seaside Nature Center. Pre-registration is required. Call 302-645-6852. Bring your lunch to this enlightening presentation relating to Nature Rescue Remedies…that really work. Learn remedies for outdoor disasters, from skunk spray to poison ivy. Coffee and dessert will be provided. $3.00/person. Tuesday, December 1st is the 21st Annual Nouveau Beaujolais Wine Tasting to benefit the Red Cross of the Delmarva Peninsula to be held at Irish Eyes, on the Canal – Lewes Harbor. 5:00 until 7:30 p.m. Tickets are $25.00 Please call 302-226-3333. There will be food, wine, silent auction and entertainment by Eddie Sherman Show. Saturday, December 5th – Holiday Cookie Walk – $5.00 per pound. Proceeds to benefit the Bethel United Methodist Church for capital improvements. It is sponsored by the Mary Martha Circle. 10:00 a.m. until 2:00 p.m. When you arrive, you will be given a container and then you will proceed to do your shopping for cookies by visiting the different cookie displays. You pick however many cookies you want and at the end the container is weighed and you pay for your cookies. Friday, November 27th – Tree Lighting in Rehoboth Beach, at the Bandstand. 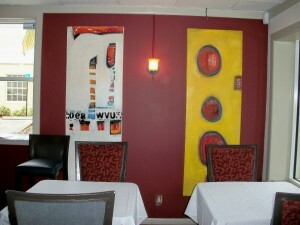 6:00-7:00 p.m.. For more info., visit www.downtownrehoboth.com. Santa’s House on Rehoboth Avenue will be open through the holidays. 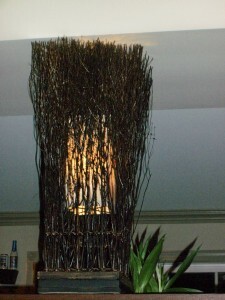 Please visit www.downtownrehoboth.com for hours, or call 302-227-2233. Sunday, December 6th – Community Unity Spaghetti Dinner from 4 – 7 p.m. at the Convention Center. Tickets are $8, seniors $5 and kids under 12 eat free. Call 302-227-2772. 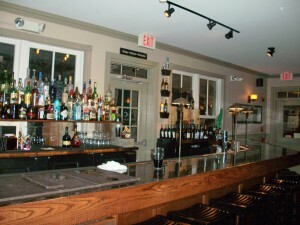 Visit www.downtownrehoboth.com for further information. Monday, December 7th – Christmas Parade – Line ups start at 4 p.m. The parade begins at State Rd., and travels east to the boardwalk, then turns west and goes back up to the Convention Center. Want to enter? Call 302-441-8615 or e-mail millman@cityofrehoboth.com for an application. Friday, Nov. 27th at 7 p.m. is the Screening of 12, which is a Russian remake of the American 12 Angry Men. Discussion will follow after the film. Please visit www.rehobothfilm.com for more information. Location: Upstairs at Movies at Midway on Rt. 1, Rehoboth. Admission $2 for members and $4 for non-members. Friday, December 4th – Cinema Cabaret – Mostly Martha. 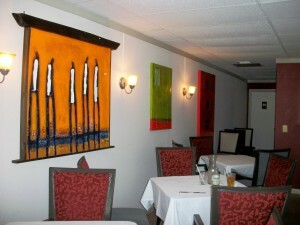 Dinner is at 6:30 p.m. at Ovations Restaurant, located at 20 Baltimore Ave., in Rehoboth. Admission is $30 and includes the film and a 3 course dinner, not including gratuity and alchohol. To reserve your table, please call 302-645-9095 or call Ovations at 302-227-9310. Visit the website www.rehobothfilm.com for more info. Thursday 12/3 – 12/25 – Victorian Christmas Celebrations include – life sized storybook window displays, horse and carriage rides, house tours, concerts, parade. Victorian fashion show and teas. Santa visits on week-ends at the Atlantic Hotel and music will fill the streets. There is a fee for some of the events. For more information, please visit www.berlinmdcc.org. Sunday, 12/6 – Mid Atlantic Symphony Orchestra Holiday Joy – at the Community Church, Rt. 589 in Ocean Pines. Call 888-846-8600 or visit www.midatlanticsymphony.org. This festive Holiday concert will have performances from the Nutcracker. It starts at 3 p.m.
Friday, November 27th – Old School Square Grounds – Trash & Treasure Yard Sale from 8 a.m. until 1 p.m. Recycle and re-use previously loved items and shop for hand crafted treasures by local artists and crafters. Kids are welcomed to ride the Holiday Carousel. For info. on participating with a booth, please note that the deadline to register is Wednesday, November 25th. Questions? Call 561-243-7922, ext. 319, or e-mail volunteer@oldschool.org. Unsold Stuff: Goodwill donation truck will be on site to take away all remaining items. Friday, November 27th – Holiday Carousel Opens – Weekdays from 5 p.m. – 9 p.m. and week-ends and school holiday break from 1 p.m. – 9 p.m. Rides are $2.00. Saturday, November 28th – Green Market on SE 4th Ave., just South of Atlantic. This market is open every Saturday from 8 a.m. until 1 p.m. Contact Lori Nolan by e-mail to nolan@ci.delray-beach.fl.us. Saturday, November 28th and Sunday, November 29th – Artists in the Park at Veterans Park, Atlantic Ave. at the Intracoastal. It is a free outdoor art festival at the Park from 10 a.m. until 4:30 p.m. For info. call Gay Williamson at 561-732-4945. 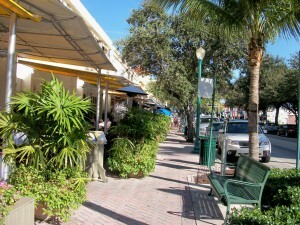 Saturday, November 28th at 11:00 a.m. is the Narrated Bus Tour of Historic Delray. 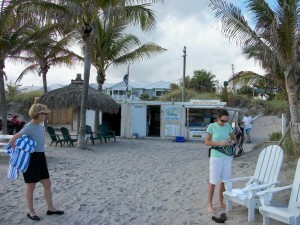 Location: Delray Public Library at 100 West Atlantic Ave. Tours are held on the 4th Saturday of each month, year round. Explore 10 historic sites that alternately are visited on a rotating schedule. $10 per person. Free for children and teens under 18. Please arrive by 10:45 a.m. For more info. please call 561-243-2662. Thursday, December 3rd – Is the famous 100 Foot Tree Lighting Ceremony at the Old School Square on 51 N. Swinton (Swinton and Atlantic) from 5 p.m. – 6 p.m. Entertainment with Santa arriving at 6 p.m.
Thursday, December 3rd is Jazz on the Avenue – Downtown Atlantic Ave. has its open house for restaurants, art galleries and shops along the Avenue including live entertainment from 6 – 10 p.m. It is free!! Great!! Monday, December 7th – Lite Up Delray City Wide Holiday Decorating Contest. It is an annual event. Homeowners, condominium owners and businesses are invited to paticipate. From 12/7 through 12/18, judges take to the evening tours looking for the season’s best displays. Streets and entrances are included and awards are given in various categories. All judges are residents of Delray Beach. For more info. or if you are a resident of Delray Beach and interested in judging, please call Carolyn Zimmerman at 561-276-1715. I hope you check my past post as above mentioned for more events and then mark your calendar for all these great holiday activities that my beach towns have to offer. When I was growing up in Puerto Rico, mojo was a side sauce for dipping sorullitos de maiz, which are like a hush puppy with cheese inside, fried plantains, and chicharrones de pollo, which are fried chicken pieces. You could really put mojo on anything, including fish, grilled chicken or meat. A basic mojo is made of garlic, herbs, olive oil and lemon juice. But, believe me, there are plenty of variations. Put the first 4 ingredients in a blender. Push pulse until it has the consistency of pesto sauce. Set aside or if not using right away, put in the refrigerator. Peel shrimp. In a frying pan, preferably non-stick, put butter and olive oil to heat on medium. Add the green onions and then the shrimp and stir fry them for about 4 to 5 minutes. Add the tomato sauce, Worcestershire sauce, and the mojo sauce and heat them up for another 4 minutes or so. You want them hot but make sure you don’t over cook them. You can serve them over rice, angel hair noodles or wrap them in a flour tortilla, burrito style. Serves 4 for an entree or 8 for an appetizer or tapas. Remember to make the recipes your own so if you feel you need more lemon or more tomato sauce or less garlic, please go for it and enjoy. Well, this post is certainly for us, women. We are always looking for the perfect bra just like we look for the perfect bathing suit. I was present when a gift from this store was given to a friend. What a good idea to give something so personal to a good friend. I decided I needed to check this store out. When I buy a bra I just go wherever; not a particular store. I buy it and call it a day. But maybe I should pay attention to what has been said. A perfectly fitted bra will show your clothes better; the person will walk taller and with confidence. Something Comfortable is located on 70 Rehoboth Ave., Rehoboth Beach, DE 19971. The telephone is 302-227-6180. The website is www.something-comfortable.com. The store is open Sundays through Thursdays from 10 a.m. until 6 p.m. and Fridays and Saturdays from 10 a.m. until 8 p.m. The owner is Sue Petty. Both Sue and Phyllis are comfort specialists. The day I went to visit the store, I knew I was going to buy something for a friend. Sue was not there but Phyllis was. She was so friendly and made me feel at ease. With so many PJ’s, bras, and apparel I did not know what to look for. Phyllis was even wearing her tape measure around her neck. Buying a bra can be frustrating. Most of us don’t even know the size we need in order to look better. Sizes vary from bra to bra and not all styles fit everyone. That is where Sue and Phyllis come in. They are professional fitters and will explain to you how the bra should fit. They will show you a size and style that is right for you. The store has a wide selection of styles, brands, sizes, and prices. These women will make sure the bra will be comfortable. Please visit the website above mentioned because they have a lot of information, including a section on frequently asked questions. Even though this store is really for women, they do carry a line of boxers for men. You will be able to see them on the website as well. Did you know that we make the mistake time and time again of thinking that we should wear a white bra under a white shirt? In reality, a woman should wear one that matches her skin or is a little darker. One interesting thing this shop carries is the Bra Bag. 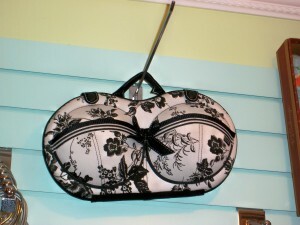 It is a hard case that will protect contour bras when traveling. These bras are pricey and the bra bag will keep them in shape. It can hold up to 6 bras, depending on the size. There are available in original or buxom. You can see it in the picture. They had 2 colors; black and pink. Are you suffering from night sweats? Something Comfortable carries 4 lines of nightwear for this problem. They wick away heat and moisture so women can sleep comfortably through the night. One brand is called Wild Bleu and it uses bamboo “Heat Release Techonoloy”. It pulls moisture from your body and evaporates the moisture 4 times faster than cotton. Something Comfortable has been on T.V. This past summer the show Making over America with Trinny & Suzannah was in Rehoboth Beach. These 2 women pick a person and live this person’s job. Then, they make the person over in 4 days. An innkeeper at The Sea Witch Inn named Natalie was picked. These women thought that Natalie looked older than her years. The show aired in September and it was called Frumpy Cinderella. I could not find it on YouTube but I went on http://tlc.discovery.com/videos/making-over-America-webisodes/ and if you scroll down you can see about 3 minutes of Behind the Scenes with Natalie. You will also be able to see Something Comfortable since that is where they brought Natalie to be fitted. For the woman that wants to look good and feel good, I think this store is a winner. I thought tonight was going to be one of those evenings that are quiet in the restaurant business. A little rainy and cooler than this afternoon, but that did not stop the 2 Debbies and myself to show up at Kindle in the heart of Lewes. I have never been to this restaurant. This past season they relocated to Lewes. Two other restaurants are part of the same ownership; Half Full and Striper Bites. When I arrived there was only one person sitting at the bar. Debbie and Debbie arrived and soon after it was homecoming in Lewes. Some of the people we had not seen in some time and others we see around frequently. Everyone had their own little group; Diane and Gene, Jimmy, Kathy, Pam, John, Brenda and we were all talking away. We went to our tables and we could all hear each other talking. Other patrons were there and did not seem to mind. 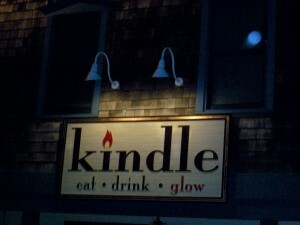 Kindle is located on 111 Bank Street. Actually, it is Second Street and Bank. 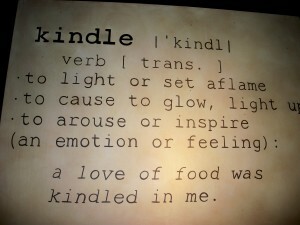 The telephone is 302-645-7887 and the website is www.kindlerestaurant.com. 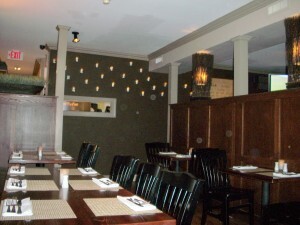 The restaurant is known for seasonal American fare and it is open year round. Hours of operation are: Lunch from 11:30 a.m. until 2:30 p.m. on Mondays, Fridays, and Saturdays. Dinner from 5:00 p.m. until 9:00 p.m. Mondays through Thursdays, 5:00 p.m. until 10:00 p.m. Fridays and Saturdays. Kindle closes on Sundays. The other 2 restaurants are good so I figure this one should be good, as well. It met my expectations from the moment I arrived. Warm atmosphere; friendly and relaxing. It is a small restaurant but it can seat a fair amount of people without being crowded. The bar is spacious and comfortable. The decor fits the name; it does have a special glow with all the candles around it; soothing, even with all of our chatter. I wanted to write this post so again, just like in the past, we ordered different entrees. We shared a first course; the Herb Smoked Trout Spread, which was rainbow trout smoked in-house, frisee and arugula in sherry vinaigrette, and grilled bread. It was delicious and perfect for sharing. We were told that we had to have the Gruyere Mac & Cheese, so we ordered this side dish for sharing as well. You know, we are trying to watch our figure, and with all this eating, it is getting harder and harder. The Mac & Cheese was good, but if I had been the one making it, I probably would have put more Gruyere. It is one of my favorite cheeses. I thought the dish was a little dry, so maybe some correction is needed. Don’t get me wrong, it’s just that I think it could have been better. Gruyere is a hard yellow cheese made from cow’s milk and named for the town in Switzerland. It is sweet but somewhat salty and the flavor varies with age. To make a 176 lb. round of Gruyere cheese, about 211 gallons of milk are used. For the main entree, I chose the Seared Diver Scallops over sweet corn, edamame, red pepper and asparagus saute, beurre blanc. They were very good and the combination of the vegetables with the edamame was a good match. Debbie had the Pan Roasted Filet Mignon with exotic mushroom demi-glace, baby arugula, saute of baby red potatoes and asparagus. She asked them to hold the potatoes and they put extra veggies instead. And the other Debbie had the Grilled Organic Scottish Salmon over toasted pearl pasta with chevre, mushrooms and celery root, roasted pepper coulis. I had a taste of the filet and the salmon and both were well seasoned and perfectly cooked. I love when the food presented is simply prepared and not hidden with too many sauces and glaces. We probably should have tasted their sweet endings but instead we chose coffees and teas. The desserts did sound good. I think I will have the Dark Chocolate Bourbon Torte, which is a flourless cake, with homemade vanilla ice cream, next time. How fattening could it be? It does not have flour! I am joking, okay? Kindle accepts all major credit cards and if you happen to be visiting my beaches, please stop by, try it and let me know what you think. Again, I have to mention that laughter is never too far behind when the 3 of us get together. The dinner was enhanced by the fact that it was shared with very good friends; Hmm, priceless!! Note: Information on Gruyere Cheese was taken from http://en.wikipedia.org/wiki/gruyere.